For those of us who have dreamt about becoming a veterinarian, graduating from veterinary school is quite an accomplishment. But that wasn’t enough for Dr. Waddell. He was an entrepreneur, leader, researcher, writer and veterinary pioneer. Even more, his courageous attitude and indomitable spirit helped him break one of the thickest glass ceilings in veterinary medicine: diversity. This month, we celebrate Dr. Waddell’s life and legacy with these five fascinating facts about Dr. William Waddell. Dr. Waddell was born in 1908 in Richmond, Virginia. He was the son of a Virginia horse driver. It was through the love of his father’s work horses that Dr. Waddell developed an affection for animals. He began his study of veterinary medicine at Lincoln University and continued at University of Pennsylvania. Despite battling the ubiquity of racial discrimination and the economic malaise of the Great Depression, Dr. Waddell still passed the Pennsylvania State Board of Veterinary Medicine in 1935, becoming the first licensed Black veterinarian in the state. Later in his profession, he also became the first African-American veterinarian to practice in West Virginia. Dr. Waddell championed the science and practice of veterinary medicine to improve the health of people and animals. To further this cause, he joined the American Veterinary Medical Association which made him the first African American to do so. He continued his pioneering and groundbreaking ways by co-founding the Tuskegee Institute School of Veterinary Medicine with Dr. Frederick Douglas Patterson in 1945. There he served as the school’s first faculty member and developed novel research projects with George Washington Carver. Dr. Waddell’s intellectual curiosity lead him to investigate the medicinal properties of peanuts which was, at the time, cutting–edge research. Working with George Washington Carver, he harnessed one of the medical properties of peanut oil to create a creamy gemish to help treat wrinkles. He accompanied Carver to president Franklin Delano Roosevelt’s Georgia retreat where they massaged him with peanut oil to help relieve the discomfort of his paralysis. George Washington Carver and Dr. Waddell worked together from 1935 until Carver’s death in 1943. From 1935-1941, Waddell also researched calcium and pokeberry weed. 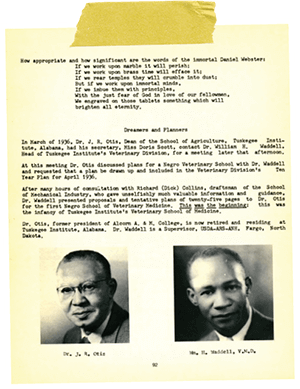 After Dr. Waddell left Tuskegee, he practiced in Morgantown, West Virginia. He then moved to Fargo, North Dakota, where he supervised the eradication of tuberculosis in cattle in the great Northwest. He received accolades from the governor for his efforts. Dr. Waddell served his country with pride and honor. 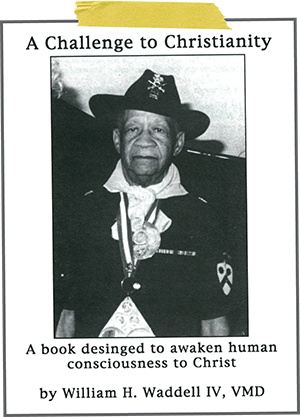 He was the first Black commissioned member in the Officer Reserve Veterinary Corps. 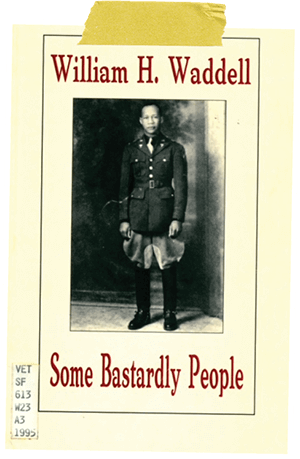 From 1941 to 1946, Waddell served the U.S. 9th and 10th Cavalry Regiments of the United States Army as a Buffalo Soldier. The Buffalo Soldiers were originally established by Congress as the first peacetime all-black regiment in the United States Army, but later operated during wartime. Showing true leadership and self-sacrificing dedication, Waddell served abroad during the Italian campaign of World War II and was later wounded in action in North Africa. He continued to attend Buffalo Soldier reunions each year up until his death. Animals have been helping to protect human lives for centuries. The relationship between the military and animals was born during the Revolutionary War and matured with the creation of the U.S. Army Veterinary Corps in 1916. Dr. Waddell understood the importance of military veterinarians while serving as a Lieutenant in the United States Army. 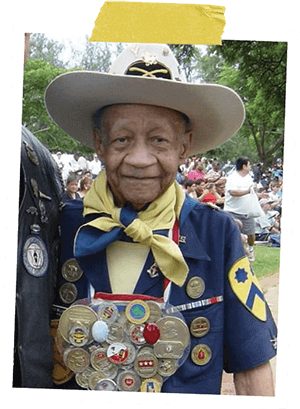 As a Buffalo Soldier, he worked as the brigade’s veterinarian to over 10,000 horses and mules. By the time he retired from service, he had earned 135 service medals.